I purchased the Tahiti outdoor furniture for my small patio. I love that the table and chairs fold for storage. 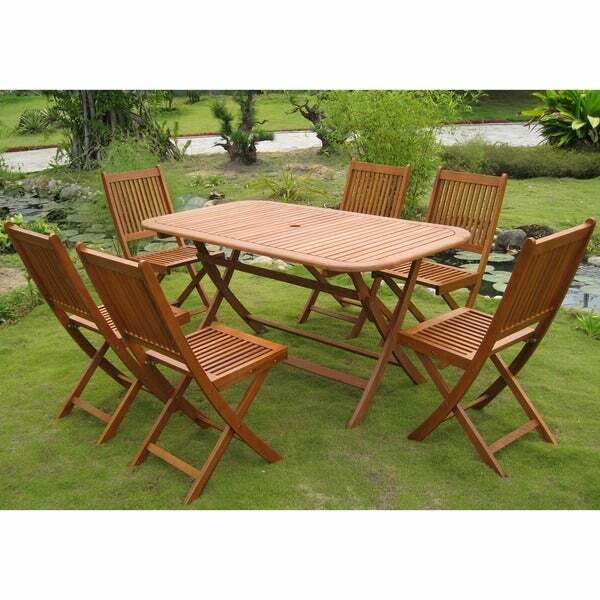 The elegance of this teak wood dining set can make any outdoor meal seem special. Fashioned with thin slats of weather-resistant hardwood, this seven-piece dining set is as durable as it is beautiful. If you decide to store the set during the winter months, it can be easily folded away. I really want to recommend this outdoor dining set because it's very difficult to find a folding set that seats more than 4 people and doesn't cost over $1,000. However... The product was missing half of the nuts and bolts needed to assemble the table. This wasn't a huge issue as I replaced them with some eye-hooks from Home Depot that allow me to secure the table to my deck when I'm not using it (it gets incredibly windy in my area, I've also had to tether my grill to keep it from rolling across the deck). However the over-all build quality is also a bit shabby. The slats on the table fastened with *tiny* screws, many of which were loose or stripped on arrival. Many of the bolts in the chairs were also loose and had to be tightened. Some of the wood on the chairs was splintered and one of the chairs had a leg that was cracked almost completely in half, making it very unsafe to sit on (the boxes showed no signs of damage). I really enjoy that the everything folds up and gets out of the way; great for my small deck. It looks great too. However I had to use a lot of my handy-man skills on it that other people might not have (and frankly shouldn't have to). And on top of that I only have 5 functioning chairs instead of 6. Just received this yesterday and assembled it so no actual use as of yet, but it seems to be a very sturdy set of furniture and I'm pleased with it. I was hesitant to make this purchase based on the only previous review (one star) which stated parts were missing, etc., but since other products from the same company had good reviews, I took a chance. The chairs come preassembled and the table only requires eight nuts, bolts and washers. No parts were missing and it was *mostly* easy to assemble. I say mostly because the instructions have no words, just two dimensional drawings. The parts of the base aren't labeled, which would be very helpful since the legs of the table need to be assembled in a very specific way. After looking at the photo of the item, it was easy to figure out. After assembling the base, if the holes don't line up correctly to allow the bolt to attach, don't drill holes, turn the base 180 degrees and they will line up. Overall, I am very happy with the purchase. It was fully assembled in less than 30 minutes and a great buy for the price! Great table set when you have to sit 6 people in a small space. Great quality. Love! "What is the maximum weight each chair can hold?" The limit is 200 pounds evenly distributed.